Posture is the attitude assumed by body either when the body is stationary or when it is moving. 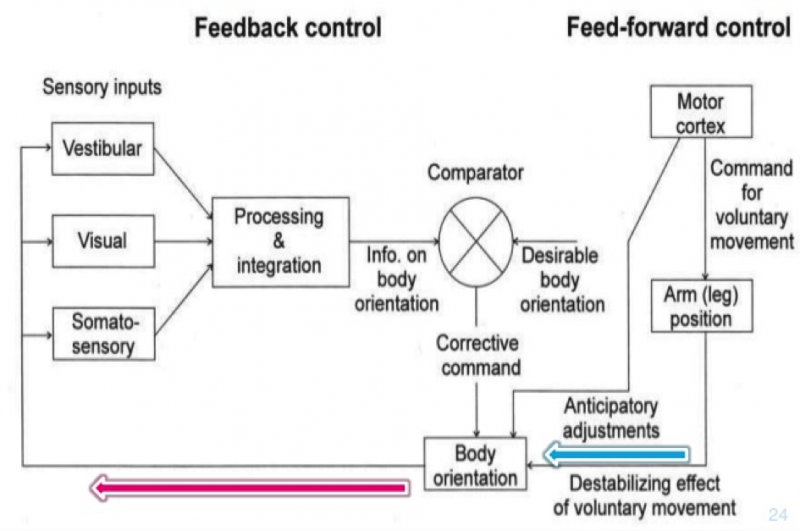 The continuous adaptations of the body posture necessary for the execution of functional activities are generated by complex interactions of musculoskeletal and neuronal systems and are defined as postural control. Normal muscle and postural tone are essentials for dynamic postural control, which in turn is the fundamental prerequisite for movement control. 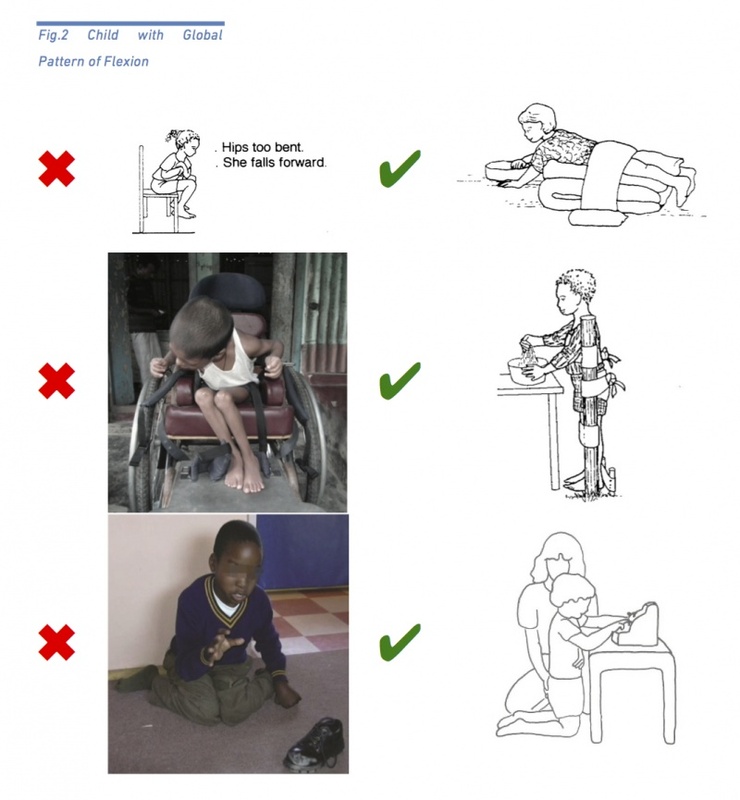 Altered postural tone (hypertone, low tone or fluctuating tone), common in children with Cerebral Palsy, affects their ability to organize and control voluntary movements effectively, producing abnormal patterns that compromise their performance during daily live activities and increase the risk of secondary complications such as contractures and deformities, pressure sores, briefing difficulties, swallowing impairments, pain etc. Moreover, adequate positioning facilitate eye contact, child communication and social interaction. The child should feel comfortable. At first the child might not like a new position but if he continues to show discomfort probably he requires some more preparation before placing him in the position (loosen the stiffness and normalize the tone) and/or some position adjustments, even if this means compromising partially the ideal position. Parents should be discouraged in forcing the child in a position if the child feels uncomfortable. The child should be stable but not stuck. The position should enable the child to experience more normal pattern of movements. For example good proximal stability of the trunk in sitting promotes selective movements of the upper limbs for playing, writing, eating etc. The positions should be varied and changed frequently. Positioning should be changed often to avoid pressure areas, to prevent stiffness and contractures and to allow the child to experience movement in different positions. 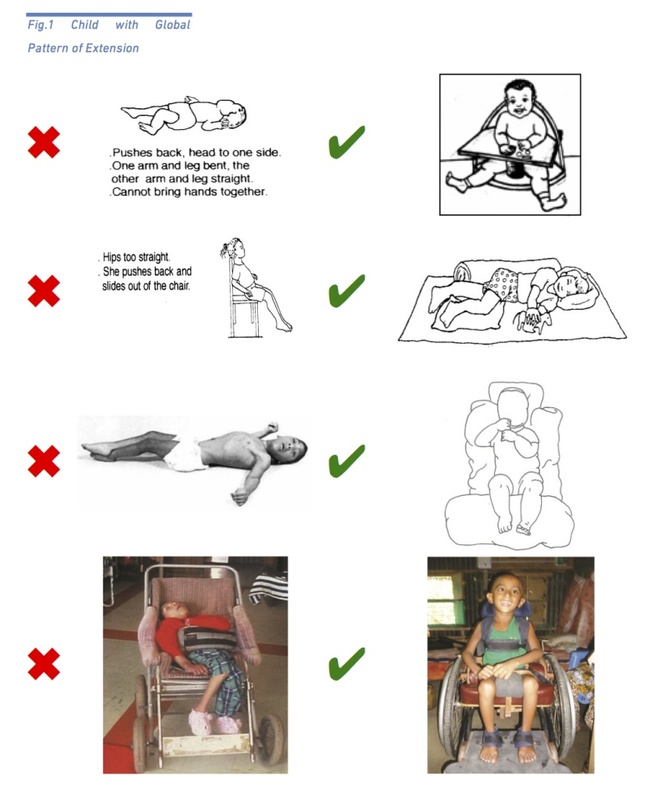 It is very important to remember that children with Cerebral Palsy may manifest with a variety of different clinical features, for example children with spastic quadriplegia can show global pattern of extension or global pattern of flexion or asymmetric postures, therefore the general principles mentioned above should be adjusted to the specific positions useful to modify/improve the child’s pattern of posture and movement. For example, if the child is habitually in an abnormally straight or extended position in lying (Fig.1 Global Pattern of Extension) it may be helpful to put him into a more bent or more flexed, symmetrical position. This might help such a child to look at and use two hands for a task at a table placed in front. If the child is habitually in an abnormally bent or flexed position in sitting (Fig.2 Global Pattern of Flexion), it may be helpful to put the child into a straighter or more extended, symmetrical, or high kneeling position. Again this might help such a child to use the eyes and two hand for a task. Equipment is used to enable a child with cerebral palsy to maintain a stable, symmetrical posture when lying, sitting or standing, so that he can practice and develop newly acquired gross and fine motor skills. The type of equipment prescribed will depend on the child’s age, specific pattern of posture and movement, child’s stage of development and whether or not deformities are present. Smaller children or older children with severe involvement and limited ability to move should spend their day in a variety of positions including on the floor and be encouraged to move about freely . Supine lying, side lying and prone position should be alternated during the day often to prevent pressure sores and avoid body stiffness. Especially lying face down is a good position for a child to begin to develop control of the head, shoulders, arms, and hands, and also to stretch muscles in the hips, knees and shoulders. Cushions, wedges, foam rolls, towels can be used to stabilize the child’s positions on the floor. Sitting becomes a truly functional position for play when a child is about 8-9 months old. By this time the typical child has good trunk control, balance in sitting and hip mobility. The typical child no longer has to rely on the hands for support, can reach out in any direction to get toys and is able to develop and practice manipulative hand skills when sitting. One should not wait until the child with Cerebral Palsy has developed all these abilities before allowing the child to sit and play and, of course, some children with Cerebral Palsy many never attain independent sitting. By choosing the right basic chair, adapted for the individual child’s needs, the child can be enabled to maintain a stable, symmetrical sitting posture so that the child can use the hands for play, feeding, communication and learning. 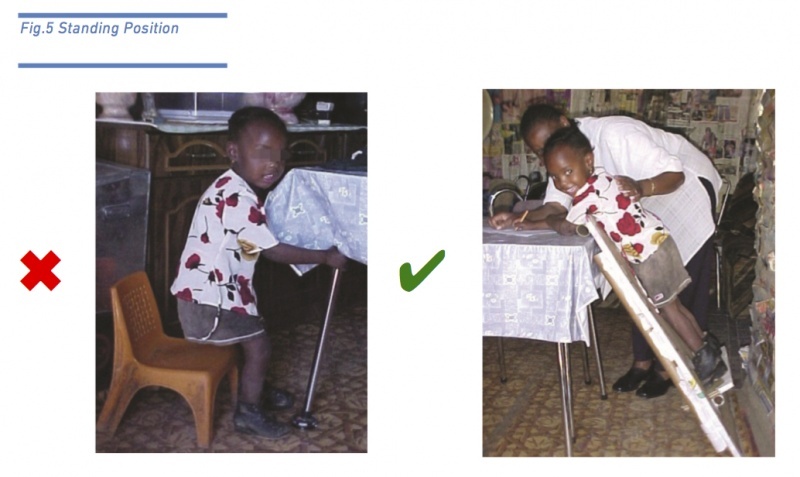 The chair should be therefore appropriately adapted for ability, ensuring sufficient control of the child’s posture yet at the same time it should encourage the child to develop as much independent sitting ability as possible facilitating at the same time daily activities such as eating, playing and learning . Different types of chairs and pushchairs or strollers provide different amounts of support and stability and the chair required by a particular child will depend upon the abilities and problems of that child. Children unable to stand on their own benefit socially from being upright for playing at a table; unsupported many CP children stand with plantarflexed ankles, semiflexed knees and adducted, internally rotated and adducted hips. 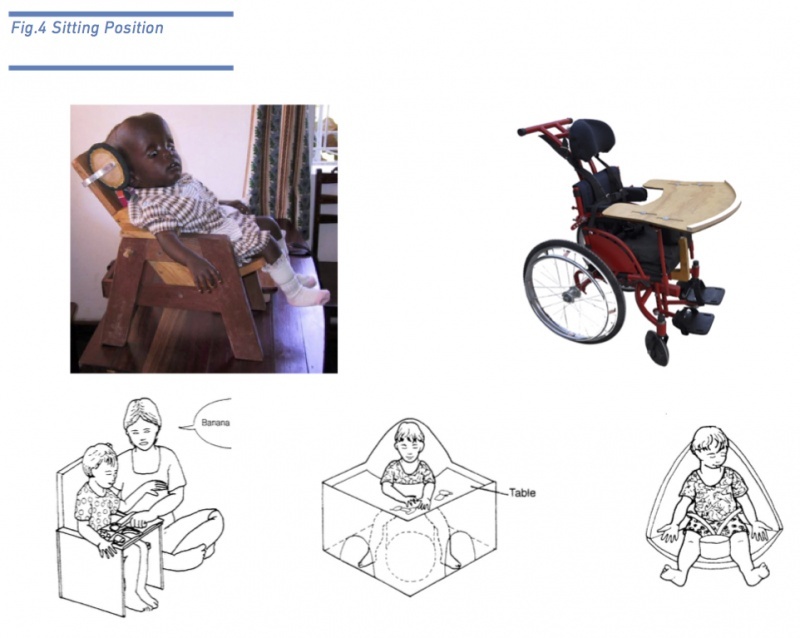 Support is needed to control posture and provide secure base and for some children standing frames are ideal. ↑ 3.0 3.1 3.2 3.3 Finnie NR. Handling the young child with cerebral palsy at home. Elsevier Health Sciences; 1997.